Yay! I've made it to the next round -- and I'm so glad too; this next one was probably my favorite so far since it was more of my thing. Having experienced busy days & learning how to quick-change for multiple events in a short amount of time in addition to commuting definitely helped influence my looks. Task #5: Take the white shirt out of your trunk (if you're just catching up, ABC Family/Jane by Design sent us a big trunk full of items which are to be used for these challenges & participants get challenges sent to us by email twice a week, that is if we make it to the next round!) and put it on your dress form. 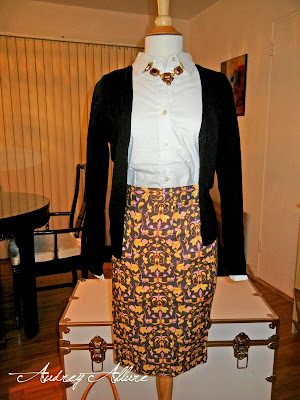 Using accessories from your own collection (or anything else you can think of), show how you would style the shirt for a day at the office. Then, change the look entirely and show me how you would style the same shirt for a dressy cocktail party. Post photos of both styles to your blog, and write an entry explaining what you did to create each look. Ask your readers to share their day-to-night styling tips here and mention the name of your blog. Here is my look for a day at the office. I paired with a black cardigan, a printed high-waisted pencil skirt, and coral heels (which aren't so high so it's still comfortable) along with a beautiful cocktail ring and a chunky necklace. The outfit is still fun but still business appropriate. 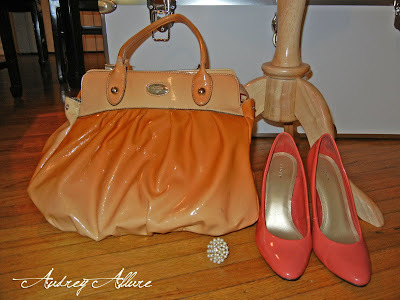 I picked that big peach ombre bag because it compliments the outfit and it's the perfect size to carry essentials... and even some extra pieces to change into for a great cocktail party after work! I ditched the cardigan and rolled up the sleeves. I changed the printed high-waisted pencil skirt into a cute sparkly mini and exchanged the chunky necklace for a fabulous pair of cluster earrings. I kept the cocktail ring, but decided to go for this stunning black clutch. For the shoes, I went just a bit higher with these wonderful color-block heels - definitely added some color to the look. And a swipe of lipstick always make a difference! P.S. Here's another exclusive clip from Jane by Design, which will premiere on Jan 3 on ABC Family! Share with me & Jane by Design what YOUR own day-to-night styling tips are here & remember to mention Audrey Allure! Remember, help me get to the end & I have the chance to pick one of YOU to be Trendsetter of the Week on ABC Family! Great tips! Thanks for sharing! Im loving the cocktail look! oh wow, i love both outfits. the first one is perfect for work. not too boring, not too all out. then the night time look is fun and flirty but still a bit conservative at the same time. 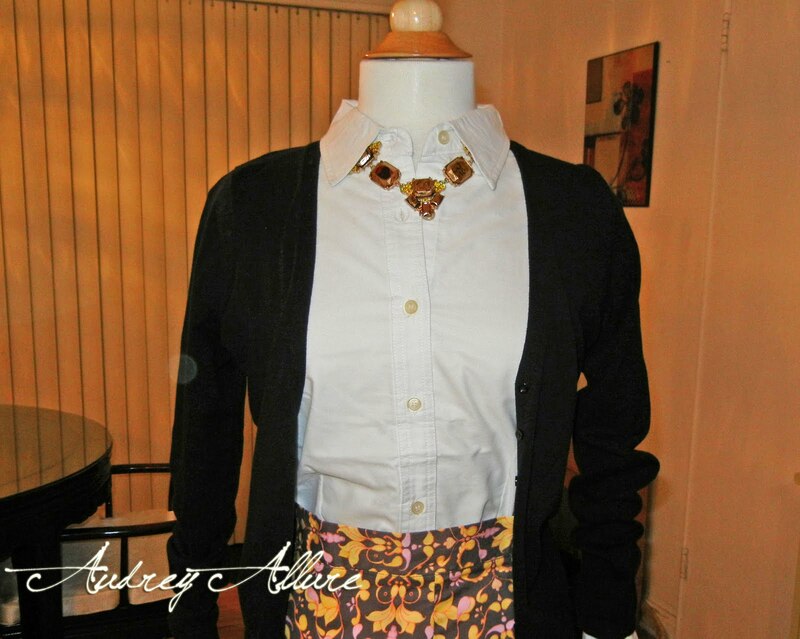 Fab outfits, just goes to show how versatile the classic white shirt can be! Love the last platform shoes. Welcome to bloggers, I voted and added you i so love the photos and look bdw AND FOLLOWING YOU BLOG TOO BDW COME THRU SOMETIME TO MY FASHION BLOG AND FOLLOW BACK TO LIKE TWITTER HEHEH!! Its awesome.. Great mix & match.. Liked the accessories.. The perfect Day to night outfit! That sparkly mini is amaazing! Best of luck! Love this! I posted on the FB page telling why I like your look! God luck! Love those colorful heels btw! hello, your blog is awesome! I like the pictures! I just adore the sequin skirt! Those color block pumps are amazing! Congrats! you did a great job once again! i love both combinations!! Those looks are both so cute! 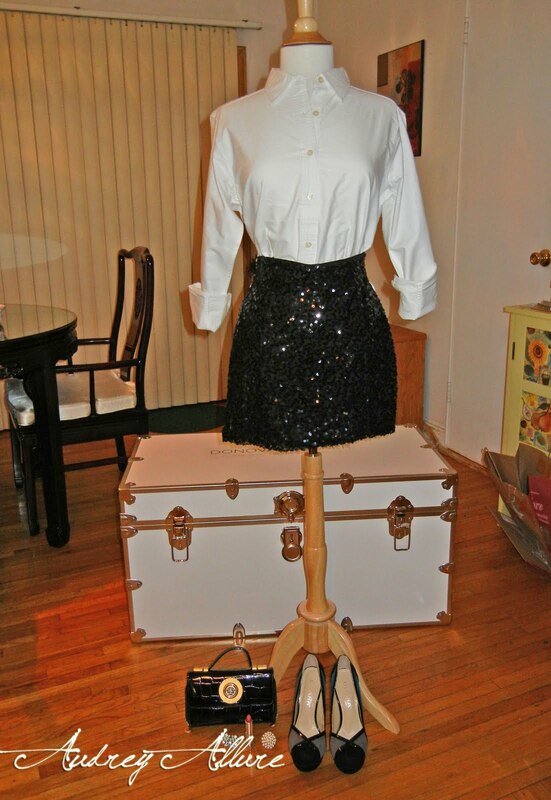 I love the sequined skirt. audrey ~ you are fabulous!! i love both looks, especially night time!! i need to pick up a sparkly skirt like this for nye!! This is such a cute challenge. You did great with both outfits. Thank u for visiting my blog. Love both looks. same shirt but completely diff. feel. Love the first look !!! The skirt is stunning !!! Everything looks great! You did a great job! These are some fantastic outfits!! Love them,especially the top one! What a great challenge--I think everyone owns a white button up and can relate to this! I especially love your night look--what fun! I love the second look. 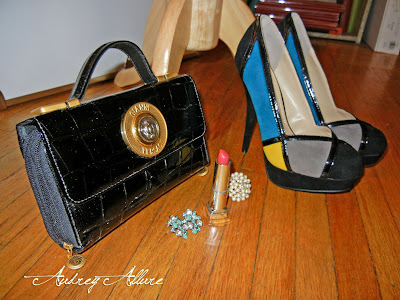 The sequin skirt with those amazing color block pumps is the best. 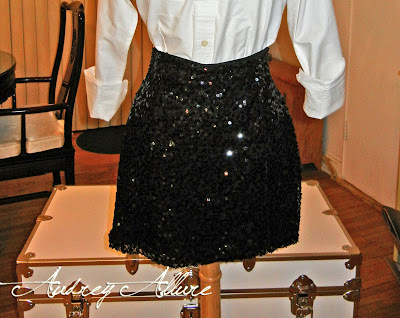 Love the blouse and the sequin skirt! i totally see why you made it to the next round!! 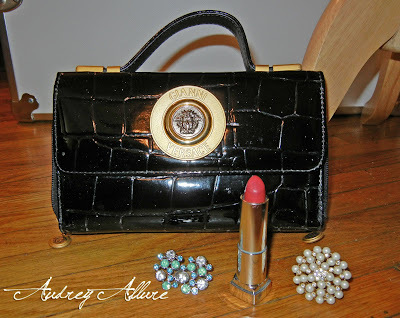 This look great Audrey, it's getting more and more interesting each time. And what a great trunk full of treats. Love the second look. 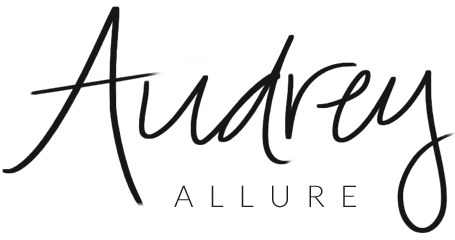 You know your fashion stuff, Audrey, but that is no surprise! Oooh, both of those looks are gorgeous!! 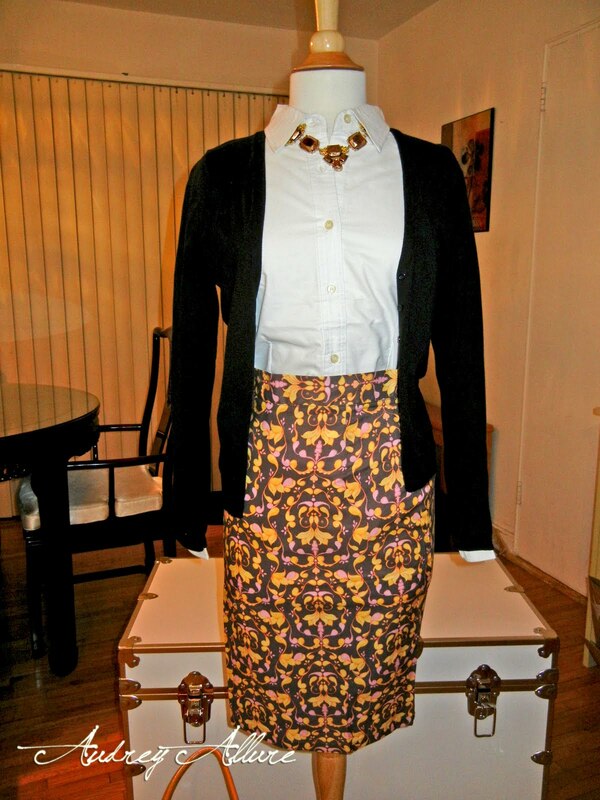 I love the print on that pencil skirt and those color blocked heels are fabulous! Audrey, this is an awesome transformation! You are doing a fantastic job!!! Gah good luck! This is fabulous and 100% perfect! i love checking out all these "Jane" projects!! i love, love, love the night look! Oh girl you nailed it. I am super excited for you.